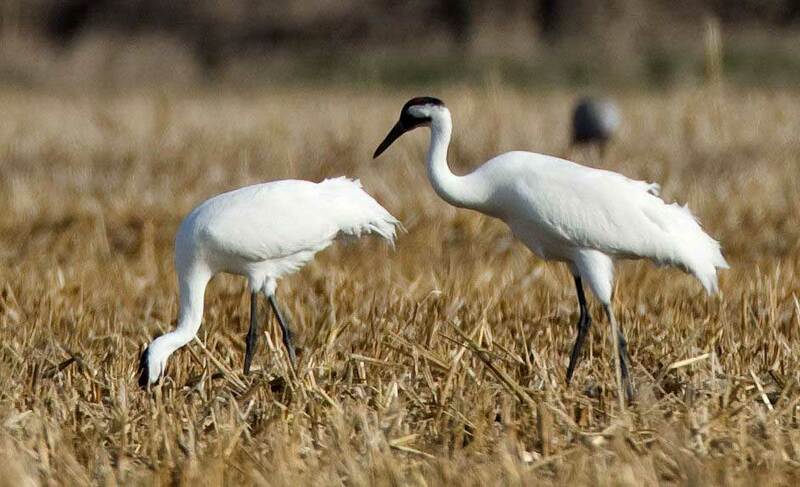 Two whooping cranes browse a cut corn field along the Platte River Valley in Buffalo County, Nebraska. LINCOLN — A biologist employed by TransCanada is disputing contentions that new transmission lines associated with the proposed Keystone XL pipeline would harm endangered whooping cranes. 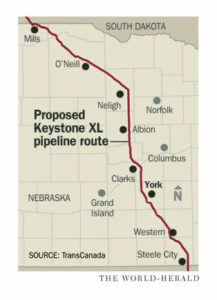 Jon Schmidt, a Florida-based regulatory consultant for the pipeline firm, said that the 36-inch, crude-oil pipeline would require only about 20 miles of additional electrical transmission lines (to serve pipeline pumping stations) across Nebraska. That, Schmidt said, represents only a .4 percent increase in the 5,471 miles of transmission lines that already exist in the migratory corridor used by the cranes, representing a “very minor” risk to whoopers. 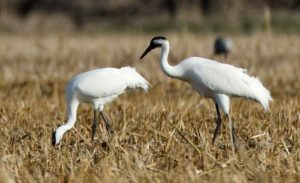 The written testimony, submitted earlier this week, rebuts testimony filed a month ago by Paul Johnsgard, a retired University of Nebraska-Lincoln professor who has written extensively about whooping cranes. Johnsgard said that the new electric transmission lines required by the XL project would “significantly” increase whooper deaths from collisions with the lines. When asked about the rebuttal on Wednesday, Johnsgard agreed that the risk was small but said that losing even one of the endangered cranes wasn’t worth it. “I don’t regard even a slight danger as something that should be ignored,” he said, adding that power line collisions are the No. 1 cause of death for whoopers. TransCanada is seeking permission from Nebraska for a 275-mile route for the Keystone XL across the state. Several pumping stations will be built, which will require building electric transmission lines to them. Read more here and let us know what you think. Friends of the Wild Whoopers is a nonprofit 501(c)3 organization.